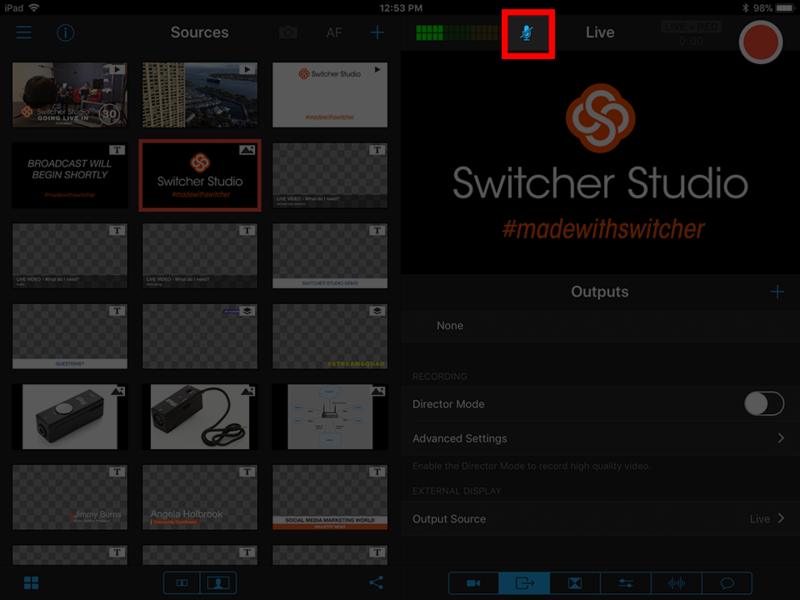 It is simple to mute the built-in microphone or audio routed via the headphone or lighting port within Switcher Studio. This feature can be useful during breaks in your live production or before you go live. At the top of the screen to the right of the audio VU meter, you will see a microphone icon. Tapping the microphone icon will show a blue outline around the icon. This means that your microphone or incoming audio will be muted. You can see that the VU meter does not have any levels when the mute option is enabled. It is important to note that this feature only mutes the microphone or incoming audio routed via the headphone jack or lightning port. Any audio associated with a pre-recorded video will play when the video goes live regardless if the microphone mute function is enabled or not. This feature allows you to choose if you want to give commentary over the video or mute your microphone so viewers can hear the video audio without other sound. This feature requires Switcher Studio 3.0 or higher.